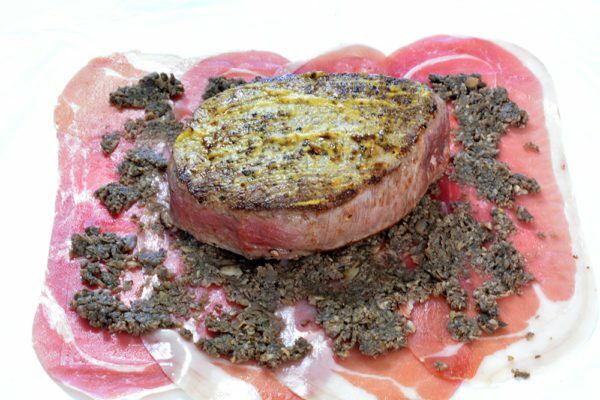 Decadent and tender filet mignon, topped with a rich mushroom duxelles, delicate prosciutto and wrapped in a golden, buttery puff pastry. 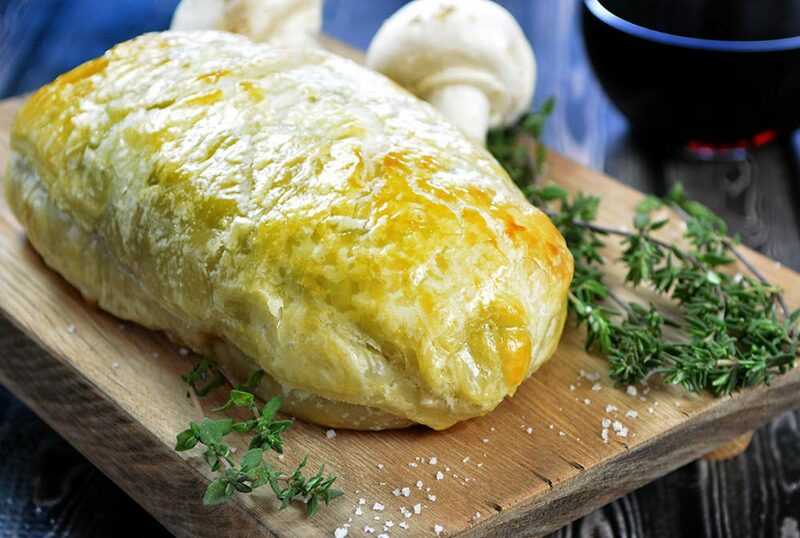 Individual Beef Wellingtons are the perfect special occasion meal. 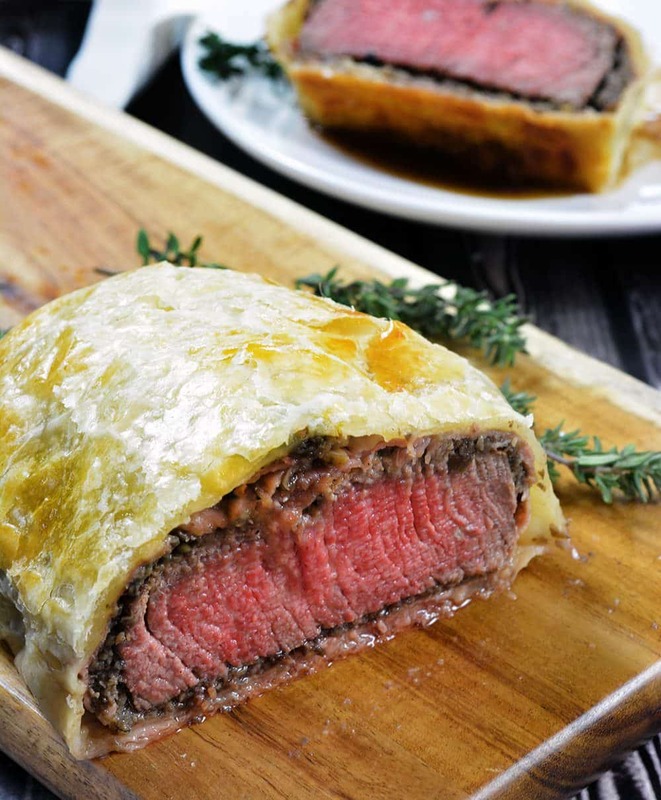 This Individual Beef Wellington recipe is right up there with our Garlic Herb Prime Rib Recipe. Both are decadent and worthy of top billing at your next holiday meal. Both can be intimidating beef recipes, however they don’t have to be. With a bit of pre-planning and focus, these two special occasion beef recipes will soon be in your foodie wheelhouse. Beef Wellington is an old school recipe from England, however is having a bit of a resurgence the past decade thanks to Gordon Ramsey and Hell’s Kitchen. What makes Beef Wellington so good is the layering of complex flavors. Once cooked you’re left with a flakey butter crust on the outside and a perfectly cooked tender medium-rare steak on the inside. 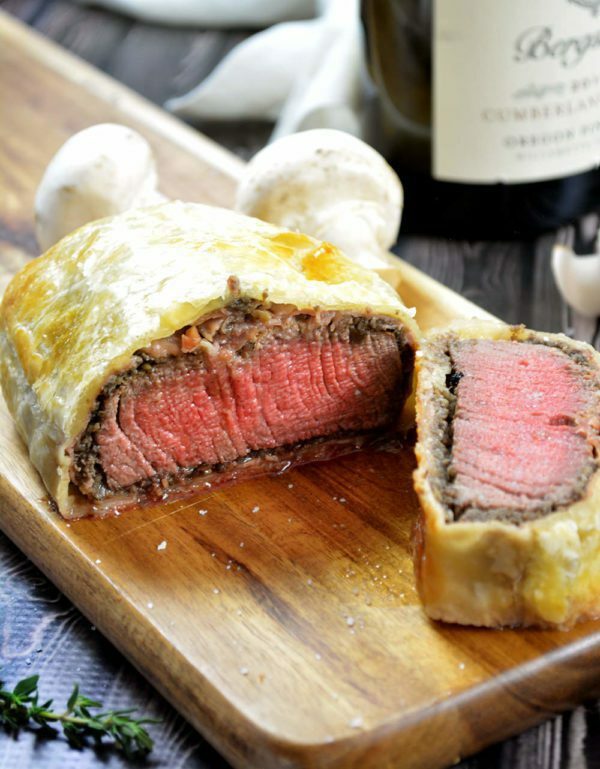 A traditional Beef Wellington recipe is an English dish utilizing the tender chateaubriand cut of beef. It’s topped with a mushroom duxelles and flavorful pâté, before wrapping in puff pastry. If you’re looking for a Beef Wellington without pâté, this recipe is right up your alley. As with Gordon Ramsey’s version, we are replacing the pâté with prosciutto (adds fat and flavor to the dish) and adding mustard (to add a hit of acidity and lightness). Even if you don’t like mustard, don’t skip this ingredient. 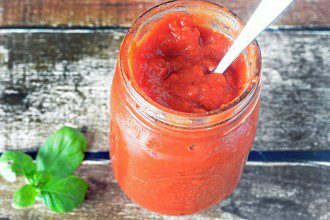 It melds nicely to the finished flavor and doesn’t have the typical high profile flavor. Of course if you’re super anti-mustard leaving it off wouldn’t be the worst thing in the world. (See “over salting the sauce” notes below). Can Beef Wellington Be Prepared in Advance? Yep. You can prepare and assemble your Individual Beef Wellington up to 3 days before cooking. You’ll keep it wrapped in plastic wrap until you’re ready to envelope with the puff pastry and pop in the oven. This is a HUGE time saver come Christmas day or Valentine’s Day. Individual Beef Wellington is time consuming to prepare. There’s no short cut other than prepping and assembling the beef days before cooking. But that doesn’t cut down on overall time. It is deceptively easy however – even though it doesn’t look like it on TV. Steps include: searing and prepping the beef, making the mushroom duxelles, assembling the wellington, wrapping the wellington and then cooking. 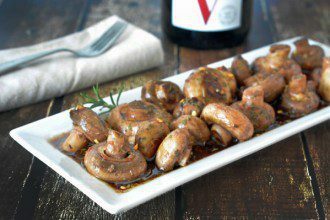 Our version includes a delicious red wine pan sauce to round out the dish. 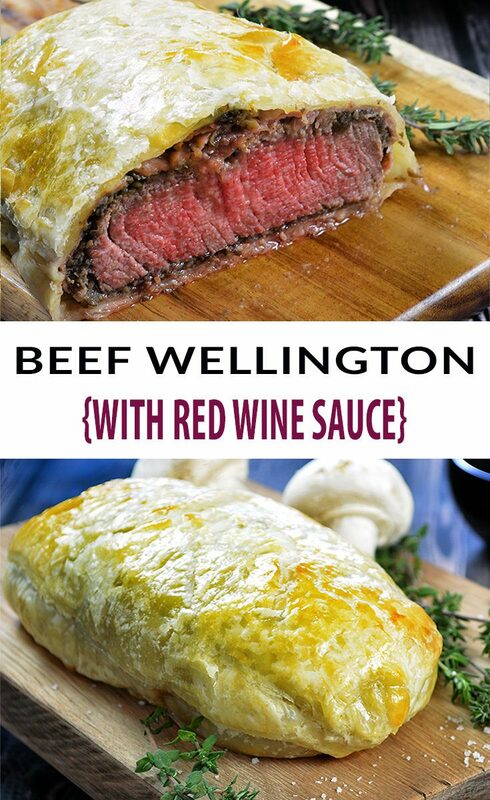 Utilizing Gordon Ramsey’s recipe as a base, I simplified it and created a simple red wine pan reduction sauce to serve alongside your Individual Beef Wellington. It’s made while the steaks are cooking. 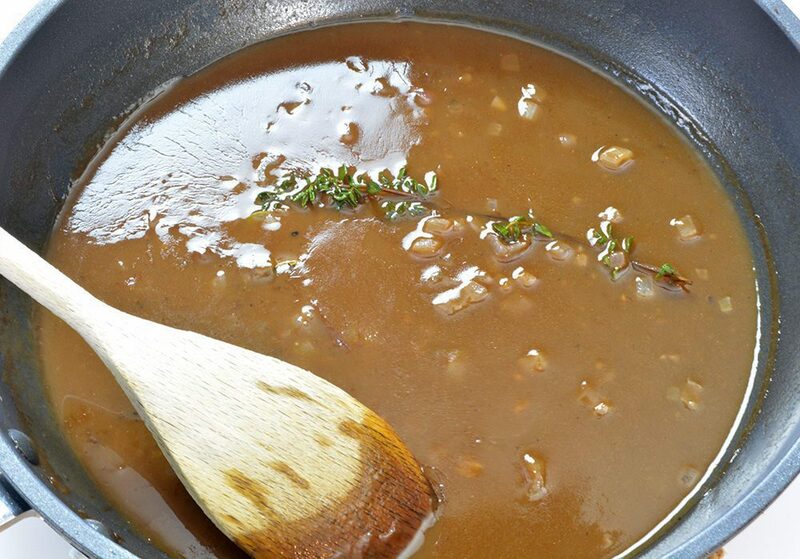 It’s in between an au jus and gravy but you can easily thin it out if you prefer more of an au jus finish. While the Beef Wellington itself is clearly the star of the show, this red wine sauce deserves a star of its own. Make sure your pan is smoking hot when searing the filet mignon. A bit of smoke should be coming off the hot oil before you add the steaks. Take care when layering the prosciutto – you want minimal tears. Tears = holes for the juices to escape when baking. An array of mushrooms creates the best finished product. Think Baby Bellas, White Button, Cremini, etc. Sure you can use just one kind, but an array is best. I use three when making this dish. Excess puff pastry = thick and doughy vs light, airy and crisp. Make sure to trim off excess puff pastry. More does not equal best. Puff Pastry should be thawed, but cold. If it’s been left out too long it’s too warm to use. It won’t puff up and brown properly. It will also be difficult to work with. If you think your puff pastry is too warm, just set it back in the refrigerator for 30 minutes. Do not skip tasting the red wine reduction sauce before salting. When using beef consommé, I find no additional salt is needed. You don’t want to bake a perfect Beef Wellington only to find the sauce over-salted. Don’t make this rookie mistake. Restrain Yo! 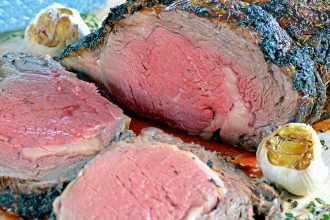 Self – As with any roast, you’ll need to let it rest for 10 minutes after removing from the oven. This 10 minute rest will help the steaks retain their juices when slicing. Defrost the puff pastry according to the package directions. 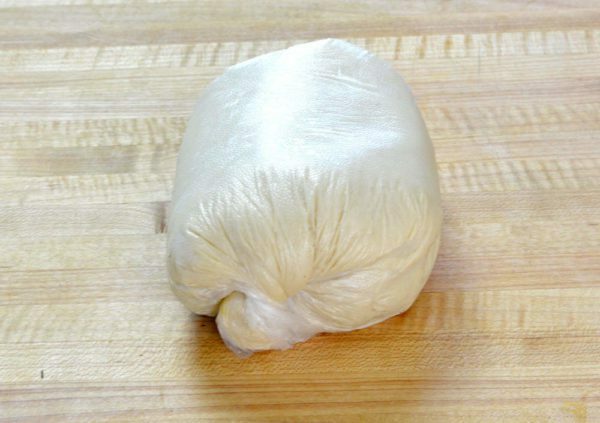 Recommendation: Transfer the covered dough to the refrigerator the night before baking. Add mushrooms to a food processor and “pulse” until you’re left with Panko sized mushrooms bits. Do not overmix - you don’t want to liquify. Pre-heat a large skillet to medium heat. Add the mushrooms and thyme and sauté for 10 minutes until the moisture has evaporated from the mix. Add the salt and pepper before transfering to a bowl. Refrigerate until ready to use. Use a paper towel to pat dry the steaks. Liberally season each side with salt and black pepper. 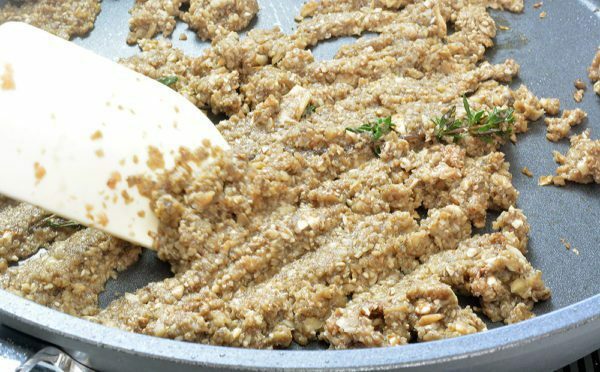 Add the olive oil to a large skillet over medium-high heat. Wait until the oil is slightly smoking to begin searing. Add the filets to the hot pan, and brown for 2 minutes on each side. Quickly sear the edges so all sides are browned. Transfer the seared steaks to a plate. 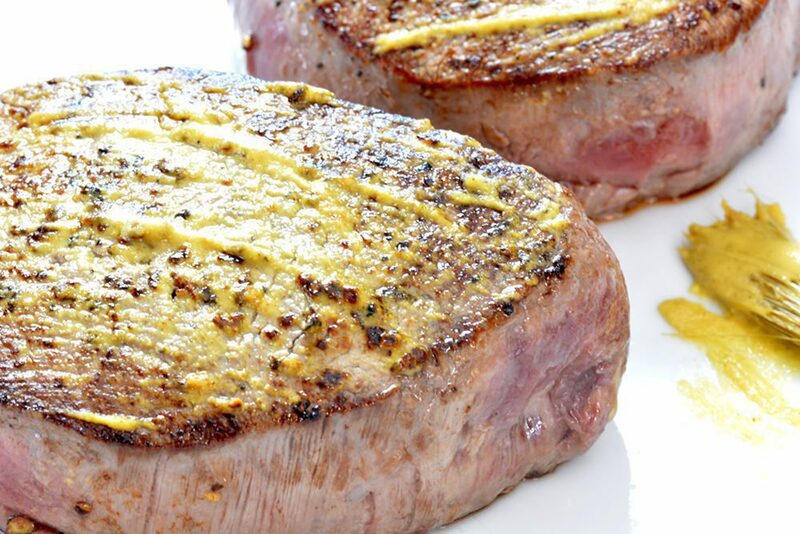 While hot, brush a tablespoon of Dijon mustard over the surface of each filet. Set aside. 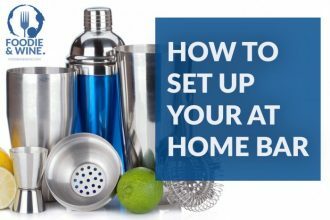 Tear off a large piece of plastic wrap and place on top of a large cutting board. Gently transfer 4 slices of prosciutto to the middle of the plastic wrap. Slices should overlap about 1/3” to help seal in the juices when cooking. Gently spread half of the mushroom duxelle over the prosciutto, leaving a 1/2” border along each side. Set a filet in the center of the prosciutto/mushroom layer. Gently roll the prosciutto around the filet using the plastic wrap to help wrap as tightly as possible (view video for visual). You want the prosciutto to be as tightly wrapped around the filet as possible. Twist the saran wrap on the edges to tighten/draw the excess prosciutto into the filet. Refrigerate for 15 minutes to set the shape. Repeat with the second filet. In a small bowl, mix the egg yolk with 2 tsp water and whisk. Set aside. Unwrap the first fillet and place about 1/3 way down the top edge, centered from left to right (view video for visual). 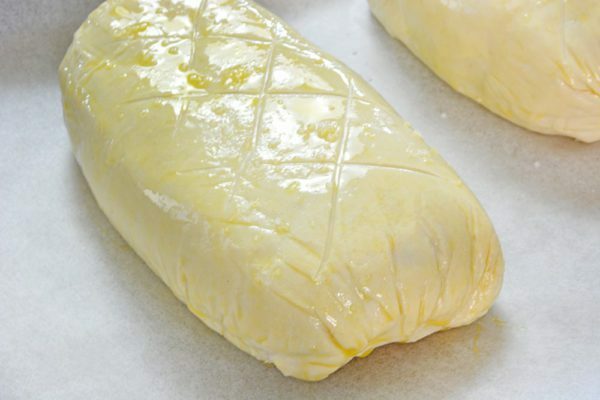 Lightly brush the pastry edges with egg wash. Gently lift the pastry edge closest to you and stretch over the entire filet. If needed, gently stretch out the dough to cover. The dough should wrap to about 1/4” under the bottom side of the filet. Cut off any extra puff pastry before you seal the seam. Press the two seams gently to seal tightly. Once the long edge is sealed, fold in the shorter sides and squeeze tightly to seal. Again - stretch the dough if need be to ensure the sides are fully enclosed. Repeat with the second filet. Tightly wrap the plastic wrap around the filets to further firm up the seams. 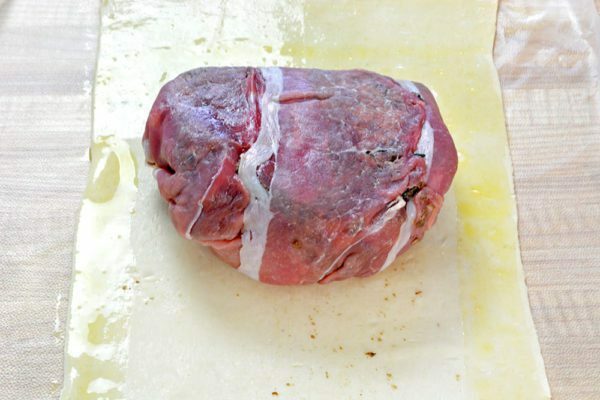 Twist up the plastic wrap on the short edges and fold under the wrapped filets to keep them from untwisting. Refrigerate for 15 minutes to set. Move the metal shelf inside the oven to the upper middle potion and pre-heat to 400 degrees F.
Line a baking sheet pan with parchment paper and place the unwrapped filets seam-side down on the sheet. Brush the tops and sides with the egg wash and sprinkle with kosher salt. OPTIONAL: Use the back of a knife to add some decorational lines to the pastry. Be gentle as to not cut through the dough. Bake for approximately 20 minutes or until the internal temperature of the steak reaches 125°F for medium-rare. Insert a meat thermometer in the side of the wellington to confirm your desired temperature has been acheived. Remove the beef wellingtons from the oven and rest for 10 minutes before slicing. While the wellington’s are baking, place the same skillet you used to sear the meat over medium heat. If little dripping are leftover, add a tablespoon of butter to the pan. Add the shallots and cook for 30 seconds. Add the red wine and stir until the wine is reduced by about half. You should no longer smell the wine at the point. Add the flour and whisk for one minute. Add 1/4 cup of beef consumme and whisk until combined and the flour is integrated. Add the rest of the beef consumme, the thyme, bay leaf and black pepper. DO NOT add the salt until the end after you’ve tasted the reduced sauce. Let simmer on low until ready to serve. Fish out the thyme sprig and bay leaf. Taste prior to serving and add salt as needed. *Please read the 'Beef Wellington Tips' section above BEFORE starting the recipe. *To serve, slice the rested steak into medallions and serve with the red wine reduction sauce.